As a function of our work in higher education, we see many strategic plans. Most of these plans contain some sort of organizational commitment, initiative, or objective related to creating and supporting a culture of innovation. At some institutions, this commitment manifests itself in the formation of an “innovation institute.” At others, we might see language in the plan that states: “create a culture of innovation.” Other institutions might set aside funds to support innovative teaching and/or continuous improvement change efforts. What predicts an institution’s ability to be successful at creating – and sustaining – a culture of innovation? Can an institution measure this? Rich Boyer, Managing Partner and Senior Consultant at ModernThink wondered this, and so did Catherine Lilly, Senior Advisor, Office of the Executive VP/CFO at the University of Michigan and the Past President of the Network for Change and Continuous Innovation (NCCI), a non-profit association dedicated to improving higher education by providing a collaborative professional network for change leadership. They agreed that the data gathered as part of the Great Colleges To Work For® program might be a useful place to begin a joint inquiry into innovative cultures. Are there pre-existing conditions necessary for a culture of innovation? If so, might those conditions be captured somehow in the Great Colleges to Work For® survey data? Is there a factor, scale, or set of statements that is a reflection of an innovative culture? If so, might there be differences between recognized and non-recognized institutions in that scale? We reviewed statements from the ModernThink Higher Education Insight Survey®, the research instrument that is the foundation for the program. The survey is comprised of 60 belief statements, broken into 15 themes, such as communication, collaboration, shared governance, etc. The survey is administered annually each spring through the Great Colleges to Work For® program to administration, faculty, and staff at participating institutions. Institutions are deemed “Great Colleges to Work For” based on survey responses. Since its inception, over 1,200 unique institutions have participated, providing us with an unparalleled database of employee engagement data within the sphere of higher education. We started with survey statements we felt captured the essence of a culture of innovation. For example, we reviewed statements that spoke to an individual’s sense of autonomy and of having sufficient resources. We also included statements that reflected the feeling that one’s input would be heard, that a person could speak up, and that an individual could challenge traditional methods. For each of these statements, we reviewed the percent positive response (strongly agree and agree on the Likert scale). There was a consistent gap of 9 to 10 points across all six statements between recognized and non-recognized institutions, those recognized having the higher positive response. So, what does this mean? For those of us at ModernThink and NCCI, more research! We will continue to review these statements as a construct, and gradually learn more. 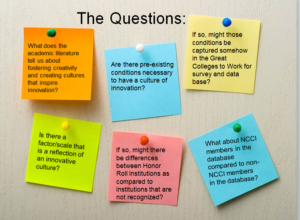 In the meantime, if your institution seeks to foster a culture of innovation, it’s safe to say a little introspection surrounding these six statements is a good first step. Help us continue our research and participate in the 2019 Great Colleges To Work For® program. The program is free. Please visit greatcollegesprogram.com for more information. The deadline to register for the 2018 program is February 11th, 2019. Richard K. Boyer is Founding Partner of ModernThink LLC. Rich is passionate about helping organizations develop their potential, having consulted with companies on issues of organization culture, strategic planning, and group dynamics since 1992. Since co-founding the Great Colleges to Work For® program in 2008, Rich is a widely regarded thought leader in higher education workplace quality. Rich received his Bachelor of Science degree in business from the McIntire School of Commerce at the University of Virginia.